It's not like Amy and I are particularly religious, but Christmas is always a special time of year for us. This year was the first in which we hadn't journeyed home to spend the Holidays with our families. We decided to fill the void of missing families, huge dinners, and old traditions by exploring the winter wonderland that is Colorado. 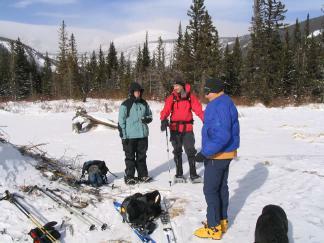 Amy, Peter and Justin enjoy some vitals at the beaver lodge on Lost Lake. The Fourth of July valley is in the background. When we first visitted Colorado in June of 2003, Amy and I hiked up to Lost Lake in the Indian Peaks with Chris and Gretchen Pankratz and their young children. Chris and Gretchen didn't accompany us all the way, but we found our own way the last mile or so to the small lake. It was choked with beaver dams, marshy and not that impressive for our first hike above 9000'. Hoping to recreate our first Colorado adventure, we met up with Justin and Peter, two single (at least for the Holidays) friends, and mounted an expedition. Justin was on his split board while the rest of us were snowshoing. The weather was in the teens and quite windy. The hike went quite well with a mile of road hiking followed by a steep ascent of a snow-covered hill and some very peaceful, snowy forest. After a surprisingly short time, we reached the turnoff for Lost Lake and shortly afterwards, the marshy lake which we'd gotten to before. Finally, we headed back down the hill encountering various other groups on the way up. We made it back to the cars by 2 pm and were safely back in Boulder by 3. The six mile hike was quite fast and a good way to get out and enjoy the wilderness and quality company on the day before Christmas. After a lovely Christmas day, we packed up and drove south, west, and north to Grand Lake. Geographically, Grand Lake is only about 50 miles from Boulder, but to get there requires a 2+ hour drive around a lot of intervening mountains. The weather was gorgeous and the drive scenic. We arrived at lunch time and, after some lovely pizza, set out for the West Portal Trailhead at East Inlet. This is the mouth of the East Inlet Creek which flows from the Divide in the southern parts of Rocky Mountain National Park, past five reportedly lovely lakes, and into Grand Lake itself, the smallest of the three large lakes near Granby. We hit the trail at 1:30 and quickly snowshoed past the frozen and unimpressive Adams Falls on some moderately steep trail. Soon, we passed into the first of two large meadows. The trail skirted the northern side, but we made tracks on the frozen creek and through the tussocky, snowy marsh aiming for the presumed location of the trail on the far side. Mount Craig loomed treeless and snowy at the far end of the valley and the north side was flanked with some nice cliffs. After twenty minutes of thrashing through the woods on the far side of the meadow, we located the trail again and followed it to a second meadow. We set out into this meadow again, but kept close to the left side where we could locate the trail again. The first meadow at East Inlet. Mount Craig is the snowy, rocky one at the head of the valley. Another half mile of hiking brought us to a bridge across a small creek. The frozen creek tumbled over a waterfall between some boulders. I entertained myself for a while with my crampons and both ice axes trying some ice climbing moves. I'd never particularly concidered ice climbing something I'd like to take up, but wow! Having sharp implements attached to all four limbs is a very powerful feeling! At that point, a lone woman came by dressed in denim with light-weight hiking boots. The trail had been pretty well packed up to this point (if nothing else by having Amy and I pack it down), and snowshoes weren't entirely neccessary. 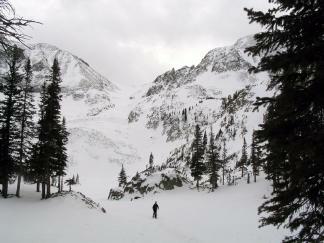 However, the packed trail stopped here and a faint set of ski tracks were the only guide further. "Do you know if there are any wild animals around here?" the woman asked. "Uhhh," I said, not knowing quite where to start. There had been tracks of all sorts of animals from elk-sized on down to small rodents all over the last two miles of trail. It would be hard to miss them and harder to mistake them for human prints. I opted for a non-committal answer: "Well, those prints you're standing next to are cayote tracks." "Oh! Maybe I'd better turn around." Amy and I followed suit and returned to the car uneventfully by about 4:30. Total distance about 4 miles. Early Monday morning we dropped by the wonderful Grand Lake Sports Shop and Massage Therapy Center to pick up some cross country skis and get some advice on where to use them. 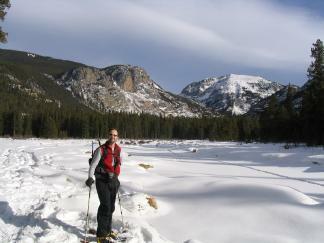 We were successful in both missions and were soon headed up US-34 toward the snowy west entrance to RMNP. At the road closure 10 miles in, we parked and prepared to ski. The Neversummer Mountains form a north-south range parallel to the main ridge of the Park. The Continental Divide makes a huge turn here and the resulting long, narrow valley provides the headwaters for the mighty Colorado River. The Neversummers are younger than a lot of the Rockies and correspondingly pointier and more impressive. The resemblance to the Southern Alps of New Zealand was striking. The weather was a bit gloomy, but bits of sun kept our spirits up. Immediately, we were faced with a steep, well-packed hill with sharp curves. Off came the skis and we hiked up. The back side of the hill was more typical of what we would find that day with a long, gradual down-hill run on narrow trail on the side of a hill. I grew up with XC skis and am reasonably proficient at controlling them. This was only Amy's third time on free-heel skis and, all that concidering, she did pretty well. Beautiful as it was, the trail was quite difficult in places and icy enough that uphill was challenging and downhill was too fast for comfort. The narrow trails and trecherous conditions combined to make life generally interesting. 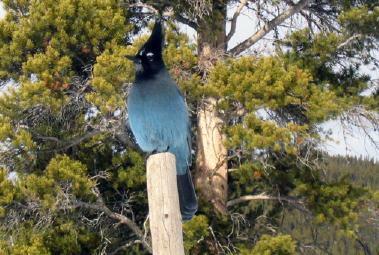 A Stellar's Jay at the trailhead. Mighty rivers have modest beginnings. The Colorado River a few miles from its source is a thing of quiet beauty. We skied along side and sometimes along the frozen surface of the Colorado River. It was amazing to think that the river I could stand in the middle of and touch the trees on each side with outstretched ski poles, was the same one that carved the Grand Canyon! Great things have modest beginnings. 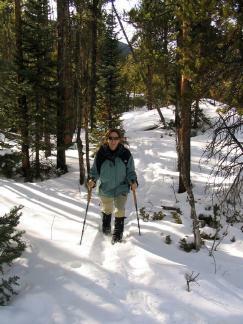 After two miles we came out into Shipler Park, a broad meadow with thin snow and many shrubs and willows. The going got harder here traversing across a steep, wind-loaded hillside. Eventually we got back into more even woods and called it a day. Turning around, I decided to ski the river instead of the more rolling trail. 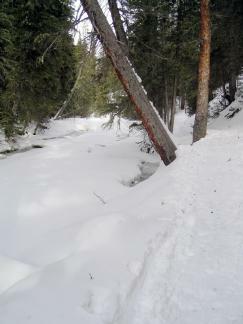 This proved to be a tremedous slog through deep snow only to find that the river was not skiable (too much fast water which wasn't frozen yet). After much effort and angst, we made it out and back to town for a well-deserved dinner. 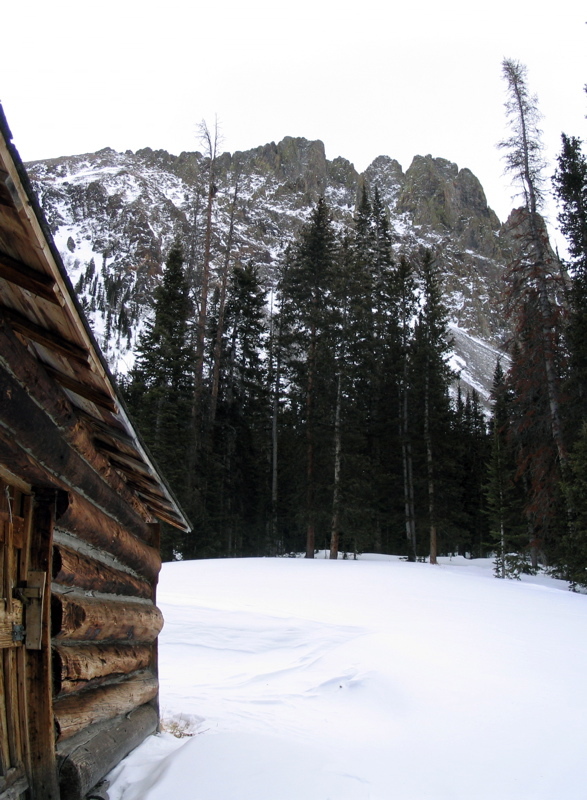 The Nokhu Crags from the abandoned Lake Agnes Cabin. Instead of retracing our path south over Berthoud Pass and I-70, we decided to take the longer route north via Cameron Pass and Poudre Canyon to Fort Collins, thence south to Boulder. 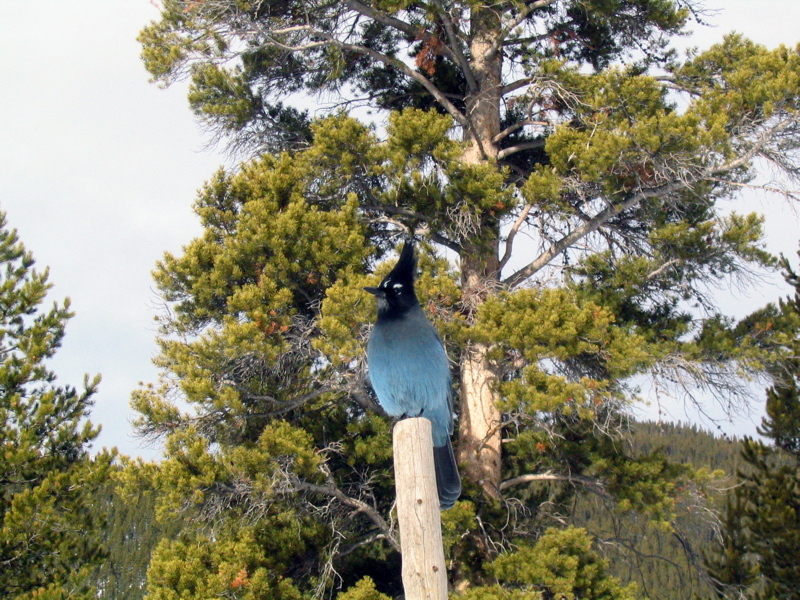 We drove through beautiful wilderness up and over the snowy Willow Creek Pass in the Rabbit Ears Range, then down into North Park on CO-125. From the tiny town of Rand, we headed north and east on CR27 to cut off about 20 miles of driving. CR-27 was 13.5 miles of dirt road, snowy and icy in sections, and lots of fun. We emerged at US-14 and turned east toward home. The goal for the day was a hike to Lake Agnes at the northern end of the Neversummer Mountains. Indeed we were just across the Divide from where we'd been skiing yesterday and probably no more than seven miles in straight-line distance. 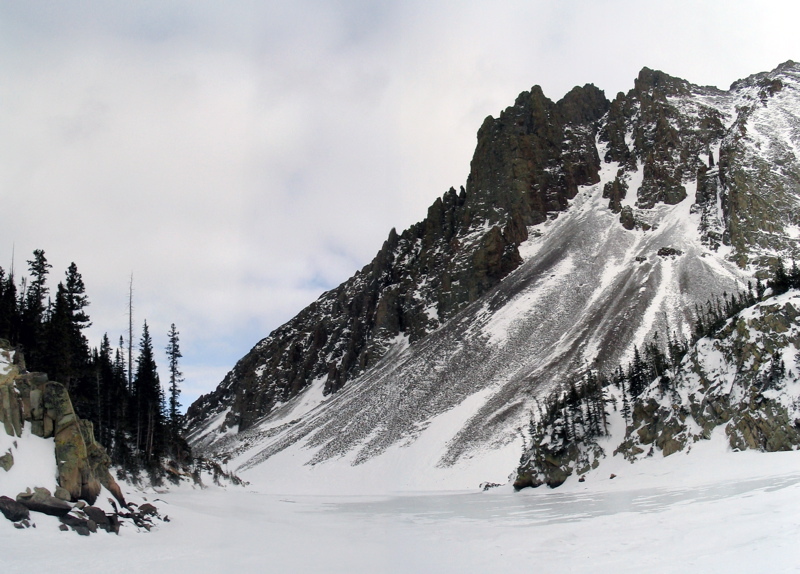 Lake Agnes is featured in both of our Colorado snowshoing guidebooks as well as the geology hikes book I'd given Amy for Christmas; we figured it must be impressive given all this press. The trailhead was down 3/4 of a mile of single-lane, snowy road with steep hills and tall snowbanks on either side. We parked in the ample parking lot (the only non-SUV vehicle there), and prepared to hike. Between the three guide books, there was quite a lot of confusion about how far the hike would be: one book said five miles round trip, another said 1.6, and the third book quoted seven miles! The impressive Nohku Crags (which rise above the lake) were easily visible and didn't look like they were all that far away. We were optimistic. The first mile or so of trail followed a steep, winding road which is apparently open in the summer to passenger cars. The road was well-packed and walking was easy, but we gained elevation steadily and were soon tired from the exertion. The weather was much as it had been yesterday and occasional fat snowflakes fell from a generally overcast sky. Soon the trail levelled out and we arrived at the disused Lake Agnes Cabin. A sign proclaimed that the lake itself was 0.8 miles distant with 480 feet of elevation gain. 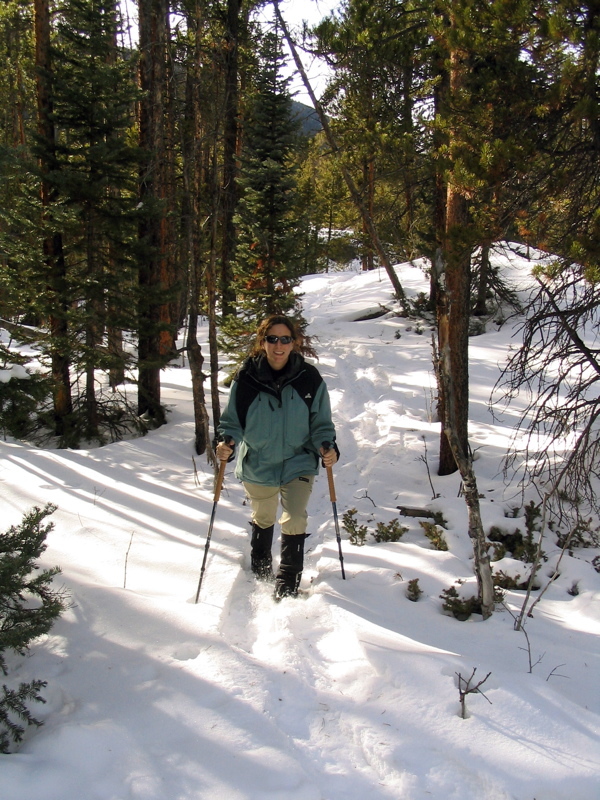 The well-packed trail ended and we followed a faint set of snowshoe and ski tracks across a meadow and up a series of quite steep snow slopes. I longed for a sled for the descent! Just when we thought the lake must be over the next rise, another one would appear. Finally, thoroughly winded, we arrived at the top of the last rise and found no lake! We descended, following a single set of tracks through dense, steep forest before finally emerged at the lake shore. Most alpine lakes in Colorado are simple puddles of various sizes lined with trees, cliffs, or some combination of the two. This lake, frozen though it was, was large and extremely aesthetic. We emerged in a small, rocky bay. We could see a tall, rocky island standing in the middle of the rather large lake with various inlets, rocks, groves, and talus fields ringing the opposite shore. On the far shore stood the impressive walls of Static Peak, Mount Richtofen, and Mount Mahler. The Nokhu Crags, impressive from a distance, loomed over the northeast end of the lake in their true, huge glory. The largest talus slope I've ever seen cascaded down from their pinnacles and formed the dam at the lake's outlet. The mighty Nohku Crags above the outlet of Lake Agnes. The talus slopes are the biggest I've ever seen and the cliffs themselves are several hundred feet high. Feeling very small amongst the towering cliffs of Static Peak and Mount Richtoffen. The weather was cold and windy with light snow. I circumnavigated the island looking for a convenient way to climb to it's summit (none were in evidence), trekked over to the outlet (finding the summer trail in the process), and returned to the bay where Amy was busy fending off the wildlife. We had a nice lunch of crackers, cheese, and chocolate. The resident quartet of whiskey jacks (aka Grey Jays) are so tame that they immediately showed up expecting handouts. One of them even grabbed a cracker from my hand displaying uncharacteristic boldness, even for these fearless, social birds. Eventually we took our leave of the lovely, desolate lake and retraced our steps. On the way we found two nice looking snow descents which, had we been equipped with ice axes, might have been tempting. We got back to the car at 2:30 after probably five miles of hiking. I suspect that seven miles is from the turnoff from US14, five miles is from the winter parking area, and the 1.6 mile distance is from the Lake Agnes Cabin. Spectacular area and one I look forward to exploring in the future.